The FoodFloor® resinous flooring system is ideal for all food and beverage processing, manufacturing, and packaging plants, including freezers and refrigerated spaces. This polyurethane matrix system is anti-microbial, promoting food safety, and meets USDA and FDA standards. Every Cornerstone flooring system offers a durable, skid-resistant surface that holds up to heavy machinery, high traffic, and dust. 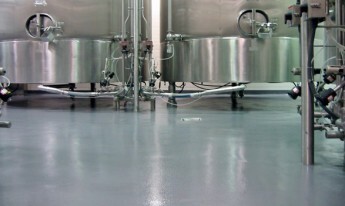 The FoodFloor® system is engineered slurry polyurethane flooring system with topcoat that includes a polyol made from castor oil and lasts longer than conventional food and beverage flooring options. Our slurry matrix polyurethane is more than a finish or a product. It’s an aesthetically pleasing flooring system engineered for versatility and functionality. Cornerstone flooring systems are engineered with their environmental impact in mind. Through our growing Green Building initiative, we are continually developing new manufacturing processes that are environmentally responsible. Our products can help you achieve LEED Credits in both new and existing facilities. For more information, and flooring system options, view our technical data sheets. The FoodFloor® flooring system above presented the Cornerstone installation team with a tight window of execution and some unique obstacles to overcome in order to implement a new flooring system in this 10,000 sq. ft. beverage manufacturing facility. See how.